Foliage.org: What are the projected dates for Cobb County, Georgia foliage season? Are there areas, vistas, scenic lookouts or other destinations within Cobb County that are known for their uniquely beautiful autumn foliage displays? Saddle up your horse, fill your canteen, check your compass and set your course for a rip roarin’, rootin’-tootin’ good time with loads of FREE storytelling, folklore, music, dancing, crafts, poetry and entertainment. Gather ’round a campfire or ride in the comfort of a hayride wagon as you journey through time to meet rustic cowboys and frontiersmen, mountain folk, Native Americans, Civil War soldiers and fearsome pirates of the Caribbean. Observe living history, marvel at colorful, costumed personalities and listen to a variety of storytellers share their experiences. Surprises, thrills and treasures are sure to abound everywhere you turn. A variety of ethnic foods and regional dishes will be available for purchase, as well as entertainment provided by groups representing different cultures. Children attending Folk Tales by the Rails are encouraged to dress in their favorite costume or character for a contest that will take place near the Depot stage at 5:30 p.m. Finalists will be chosen in the crowd and will be judged by audience response. Prizes will be awarded. At 6:00 p.m., the City of Kennesaw will announce winners of the Incredible Pumpkin Trail decorating contest. Also near the Depot stage, Emmy® nominated puppeteer Lee Bryan, “That Puppet Guy,” will perform two FREE shows of The Zany Zoo at 7:00 p.m. and 8:00 p.m. Among the myriad members in this merry menagerie are the antics of a frog on roller skates, a weightlifting bear, a juggling dog, a bumblebee ballerina and a belly dancing bunny… delights for both the young and the young-at-heart! Call (770) 422-9714 for more information. Glover Park-Marietta Square. The 33rd annual Harvest Square Arts and Crafts Festival, sponsored by the Marietta Parks and Recreation Department, will feature many local and area artists and craftspeople. Exhibits will include painting, pottery, woodwork, metal, jewelry, glass, fabric, floral designs and much more. Call 770-794-5601 for more information. Village Green in Smyrna. Call 770-434-6600 for information. Shop the arts and crafts market and experience a wide selection of festival foods as you stroll downtown at Smyrna’s Spring Jonquil Festival. Be sure to visit the Featured Artists Market and Fresh Harvest Market. Are there historic or cultural sites that are popular destinations for Georgia Fall foliage travelers? What are they? 2,884 acre National Battlefield that preserves a Civil War Background. Two battles between the Union and Confederate forces took place here during the Atlanta Campaign in 1864. In order to ensure that visitors have a meaningful and educational visit, the Organic Act of 1916 was established. The National Park Service preserves unimpaired the natural and cultural resources and values of the national park system for the enjoyment, education and inspiration of this and future generations. Visitors Center features Civil War uniforms, guns, cannon and a medical kit for students to view. Cheatham Hill., The Illinois Memorial and surviving Confederate and Union trenches. 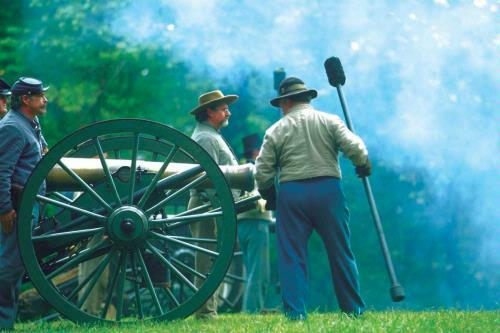 More than 1 million visitors a year, which makes it in the top 10 of the country’s 300 national battlefield parks. What are some other popular tourist attractions for autumn travelers to Cobb County What are some of the less well known, but much loved local attractions? The Silver Comet Trail is a 61.5 mile-long, converted rail-trail going from Smyrna, about 15 miles Northwest of Atlanta, to the Georgia-Alabama state line; there it meets the Chief Ladiga Trail, the continuation of the old Seaboard Air Line train route. Many treasures, unique and inexpensive, await you here in Cobb County. Nestled among eateries, tearooms, and an abundance of Southern charm, shops in Cobb offer a wide range of goods from unique collectibles to the finest in period antiques. Cobb is bursting with riches in Acworth, Austell, Marietta, Powder Springs, Kennesaw, Smyrna, and the smaller communities of Mableton and Vinings, which offers their own pottery, quilts, glass, and so much more. There is no time like the present to enjoy ageless antiques of the past. Scary-etta- Step aboard the trolley for a spirited 90 minute fully-narrated ride through Marietta. Learn the history of Marietta though the eyes of the dearly departed. Hear stories of the ghosts residing in the Kennesaw House and the story of the haunted Mary Meinert statue at the St. James Episcopal Cemetery. Walk briefly around the Marietta City Cemetery and hear the story of Marietta’s most famous ghost the “Lady in Black.” The ride conclude with a haunting at a local pub and former fire house that is full of spirits, both supernatural and intoxicating. Visit www.cobbcvb.com for information on hotels, restaurants and attractions. Check out our hot deals page for special offers. Is there anything else you would like to tell visitors thinking about traveling to Cobb County for the fall foliage season? When thinking of ways to describe Cobb County one phrase comes to mind, “The Very Best of Atlanta.” Cobb offers everything from thrilling amusement parks to historical national cemeteries. Shopping, history, attractions—Cobb County has it all. It’s Southern hospitality with all the trimmings. Recreation is “big league” in Cobb County. You’re conveniently located near the major Atlanta sports teams, and that’s not all. Cobb County, along with all of its municipalities, offers numerous parks and recreation centers. You’ll find major amusement parks such as Six Flags Over Georgia, White Water Park, American Adventures and Sun Valley Beach, as well as boating and fishing on Lakes Allatoona and Acworth. If you’re looking to sample typical Southern cuisine while in Cobb, you’ll find many restaurants here that know just how to dish up the grits, fried chicken, greens and other delicacies. There are ethnic establishments where you can sample exotic delights. Or, head to a neighborhood pub for a burger, a game of darts or to enjoy the ambiance of the area. Your choices run from elegant to casual. One of the major tourist attractions in Atlanta is the Georgia Aquarium. The aquarium features over 100,000 aquatic animals from over 500 different species in 8 million gallons of fresh and salt water. The Aquarium boasts a 100 foot long tunnel and one of the largest aquarium windows in the world with views into whale shark habitat. The New World of Coca-Cola is located next to the Georgia Aquarium in downtown Atlanta. Explore the past, present and future of the world’s favorite brand. From a stimulating 4D cinematic experience, to the largest collection of Coke® memorabilia, to the World of Coca­Cola favorite – the tasting experience with over 70 different products to sample. The Cobb Energy Performing Arts Centre is one of the jewels of Cobb County, costing $145 million. The venue is centrally located at Akers Mill Rd and Cobb Galleria Parkway, adjacent to Interstate 75. The venue is home to the Atlanta Opera, Atlanta Ballet and the Atlanta Broadway Series. Special thanks to Abbey Harwell of Cobb County Convention & Visitors Bureau for providing this in-depth interview on the best of Cobb’s fall foliage.